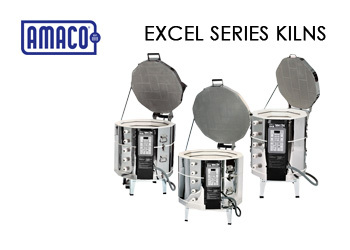 About Amaco Kilns: Not many companies can say that they’ve been in business for more than [87 years]–and almost anyone would agree that such [longevity] is a pretty remarkable event. American Art Clay Company, Inc. (AMACO) is proud to claim this distinction, celebrating with a new building, new products and an optimistic outlook for the next  years. In 2004, AMACO moved to new facilities with 50% more space than their former building. It was no small task to move a company of this size… it took 120 trailers to transport inventory, furniture and equipment form the old building to their new location. Located on 14 acres in Indianapolis, Indiana, their new home is impressive, with a main building and two exterior buildings equaling over 200,000 square feet. 170 people are employed in the facility, which manufactures many of the company's AMACO and Brent products and even includes an art gallery and the AMACO Historical Exhibition of Art Deco pieces.